Health is one of the greatest blessings and gifts of Allah Subhanahu Wa Ta ‘Ala, without which man is incapable of performing the most enjoyable and mundane of actions. Therefore, it is incumbent upon every Muslim to ensure that they maintain a healthy body and mind as prescribed by the Qur’an and Prophetic way of life. Allah, ‘Azza Wa Jalla informed the Prophet Salla Allahu ‘Alayhi Wa Sallama that all forms of cures can be found on earth, except for the cure of death. Therefore, we must strive to maintain our health and fight illnesses where possible. 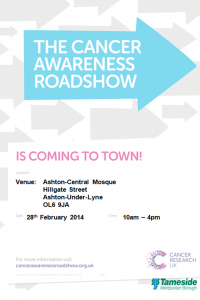 To help us maintain a healthy lifestyle, body, mind and soul, Ashton Central Mosque have liaised with the local health authorities to bring you “ The Cancer Awareness Road Show “ this Friday 28th February at Ashton Central Mosque, community hall from 10:00 am to 4:00 pm. 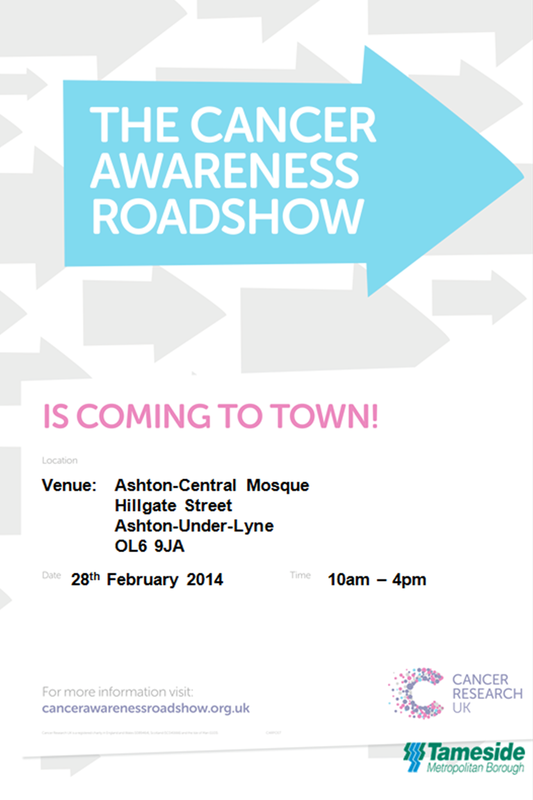 This is a free road show and everyone from the community is encouraged to come and participate.